Australian Aboriginal peoples are the oldest living; the longest continuing culture, within the driest continent on Earth. Ancient technology innovation developed by Aboriginal peoples, such as the boomerang, fish traps, spinifex resin, message sticks, fibre work, spears and woomeras, watercraft and stone tools, reveals underlying technology design and development methodologies that reflect a unified approach and value system. Aboriginal social cohesion, well-being, environmental sustainability, culture and spirituality underpins the foundation of such innovation and has been developed through systems of Indigenous governance, commonly understood as Lore (otherwise known as The Dreaming, Jukupurra, and akin to Law’). Culture has created the framework for this society and in turn, the myriad of science and technology developments, over millennia. It’s now critical timing that we reflect and initiate a new wave of technologies designed and developed through a Code of Ethics to embodies the principles of social and environmental sustainability: Caring for Country, Caring for Kin. 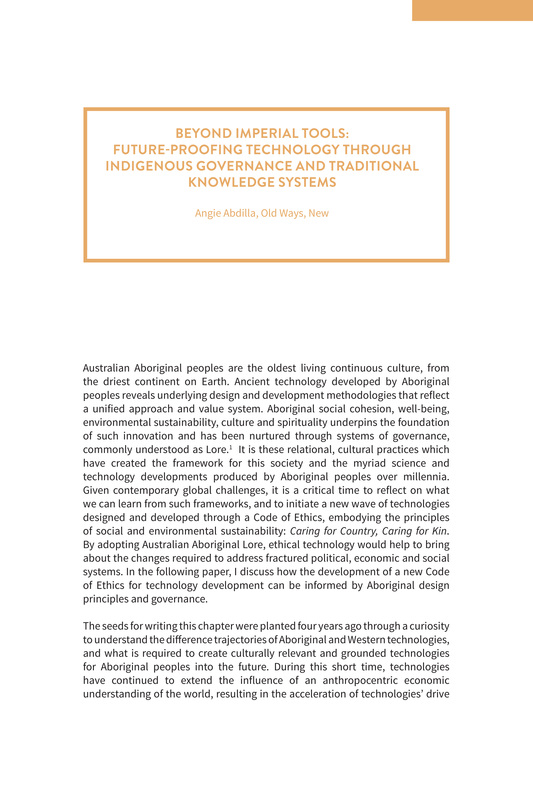 This future of ethical technology would reflect systemic change required to address a fractured political, economic and social system by adopting Australian Aboriginal peoples Lore. Here within, we discuss why and how the development of a new Code of Ethics for technology development can be informed by Indigenous design principles and governance. Angie Abdilla Trawlwoolway (Tasmanian Aboriginal), founder and CEO of Old Ways, New, leads the team of Indigenous consultants and technologists, developing social and environmental sustainability through integrated research, service and product design, and the development of deep technologies - all informed by our old ways, new. Angie is a Fellow of The Ethics Centre and regularly lectures on human-technology interactions and interrelationships at the University of Technology Sydney. Abdilla, Angie. 2018. “Beyond Imperial Tools: Future-Proofing Technology through Indigenous Governance and Traditional Knowledge Systems”. In Decolonising the Digital: Technology As Cultural Practice, 67-81. Sydney: Tactical Space Lab. http://ojs.decolonising.digital/index.php/decolonising_digital/article/view/BeyondImperialTools.